Nestled in the Tyne Valley, on our beef and sheep farm, at the edge of the North Pennines Area of Outstanding Natural Beauty Langley Dam Glamping provides high quality, en-suite accommodation in our unique glamping cabins. The four ‘Langley Longboat’ cabins are positioned on the bank of Langley Dam Reservoir, providing exceptional views over the 14 acres of water and towards Whitfield moor. Langley Dam itself is a commercial fly fishery and Troutmaster water. Visitors are welcome, and encouraged, to enjoy the fishing experience that the water provides (charges do apply, but residents have discounted fishing fees). We also have rowing boats that can be hired for fishing purposes. Sleeps up to 4 adults & 1 child, king-size double bed with childs bunk. King size sofa bed. Sleeps up to 4 adults , with two fixed single beds.King size sofa bed. Our most accessible cabin. Sleeps up to 4 adults with king-size double bed, and a king size sofa bed. No dogs in this cabin. Sleeps up to 4 adults with king-size double bed, and a king size sofa bed. The availability calendar will show dates where we have at least one cabin available. Use the search box below to view the accommodation available on the dates you wish to visit. 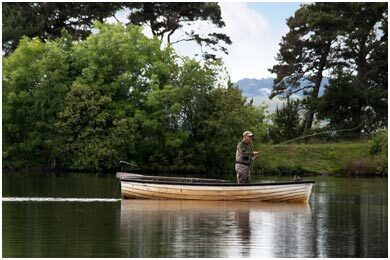 14 acres of natural water stocked with strong rainbow trout.We have glamping/fishery deals available, as well as fishing tuition (advisable to arrange in advance).